There are times in life when you know there are important tasks to be done and fast approaching deadlines hover on your mind. You genuinely want to work and give your best shot but you are unable to concentrate. Happens with everybody, right? What do you do then? For us the solution to this problem is – TRAVEL. Recently, I was feeling the writer’s block and Yogesh somehow direly wanted a break too. So we planned to travel. In between all this, we knew there was this TravelXTalks meetup that was scheduled to take place in Amritsar from 13th -16th April but somehow we were in dilemma whether to sit back and try hard to meet the deadlines or go out on a bike ride and come back home and start again with fresh mind. We obviously chose the later and became the part of SOS Meetup trip organised by StayOnSkill. We were to be accompanied by 12 most influential travel bloggers from different corners of India. Thereafter, we started planning about how and when to start our journey and packed our bags. 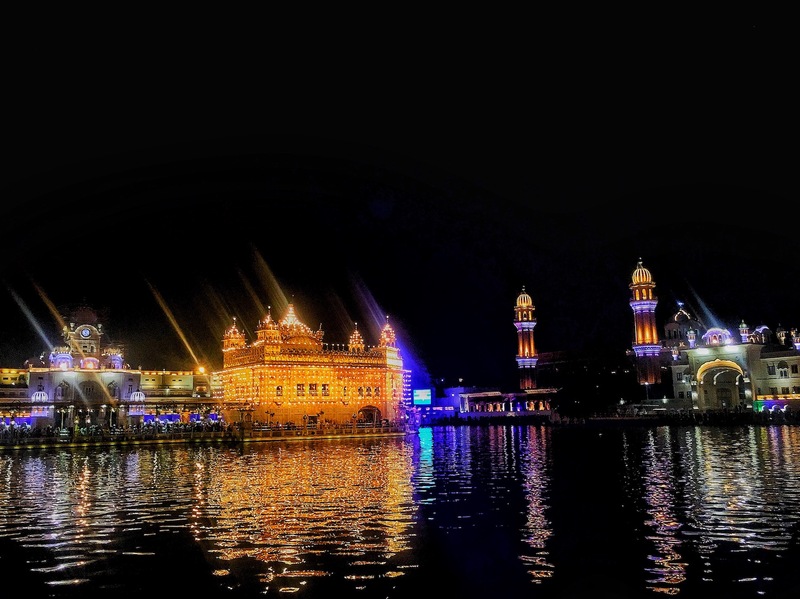 We left for Amritsar on the midnight of 12th April, 2018. 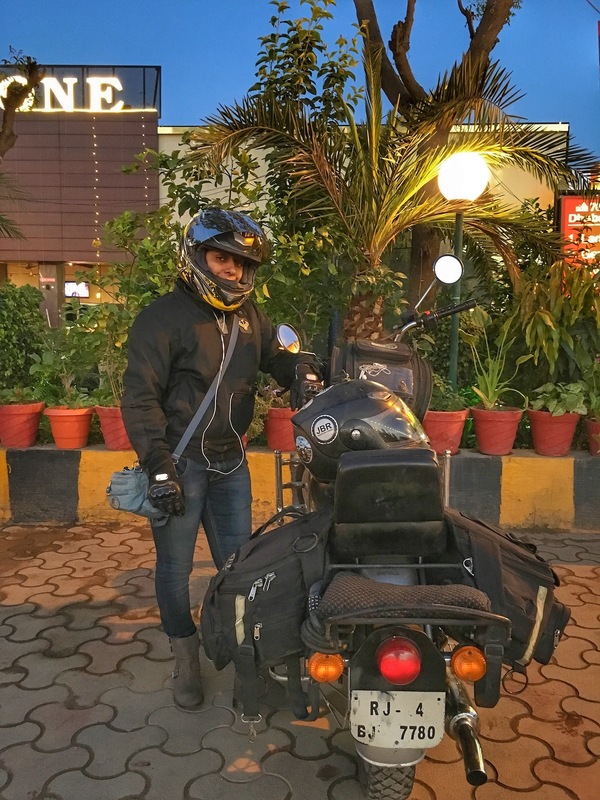 After riding the bike for 12 hours, we reached our destination – Nomads Hostel, Amritsar. 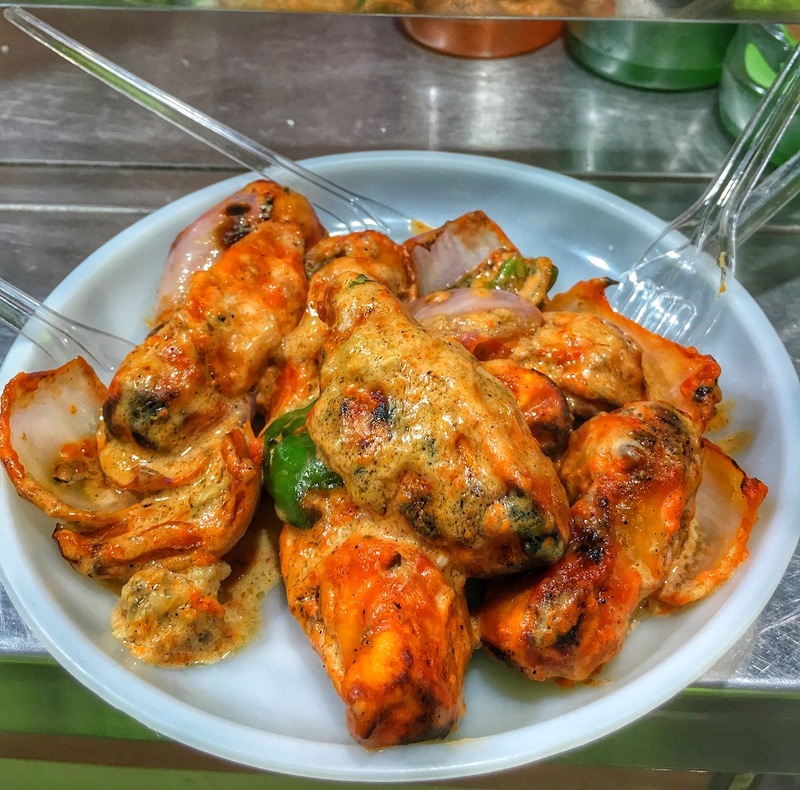 Scroll down to know about our stay, food, meet and more about the entire trip. 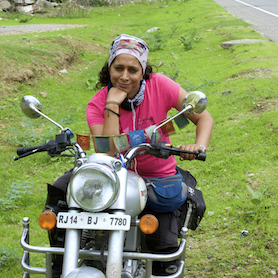 The moment we parked our bike, we were swayed by the exterior of the hostel. Bright yellow coloured Nomads Hostel with a crammed truck, wall arts and green little portions on both the side of the gate altogether left us mesmerised. 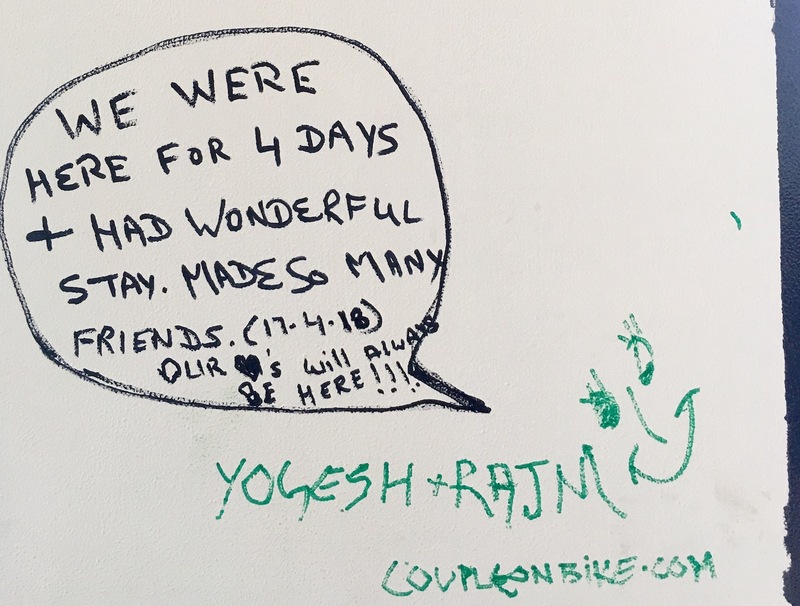 We were given a warm and heart-touching welcome by the owners of the hostel and fellow travel bloggers who we knew were soon going to be our best buddies. Hostel you all know have certain rules. We followed the rule number 1 and opened our shoes outside to make sure we did not carry mud or dirt inside. 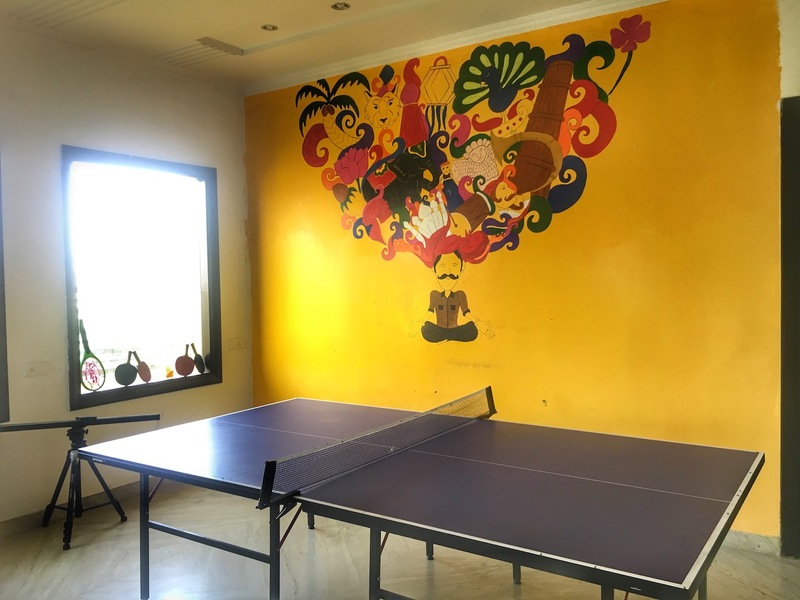 Interior of the hostel was as vibrant as the exterior. The cool wall art left us amazed and each one conveyed a deeper message. Step in and you get the positive vibes. The liveliness and chill in the air promise the cool stay. 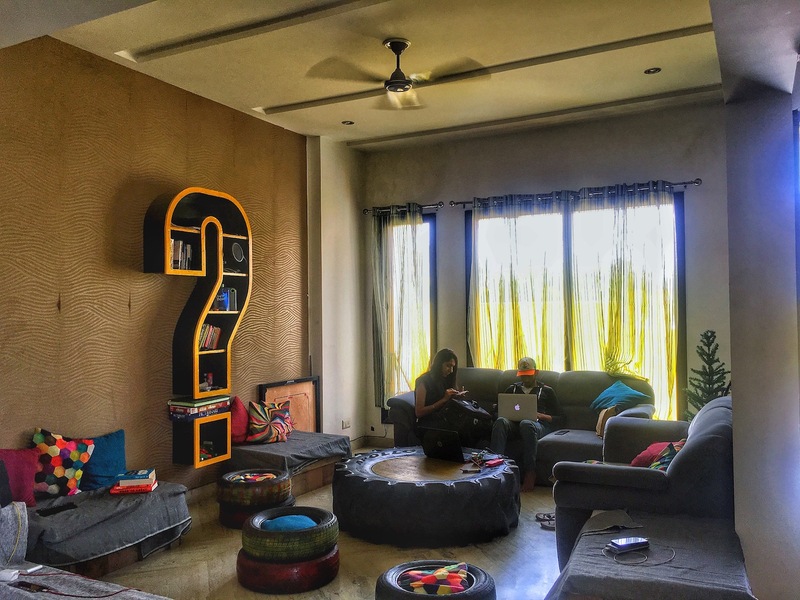 In the living room, there is a comfy sofa, cool centre table and three seating made with old tyres, a bookshelf that is in question mark design, wall art, Casio, Television, Music System, Table Tennis table and what not. Ohh did I forget the Guitar? What else could we have asked for particularly in a hostel? On the left side, there is a spacious modular kitchen where every possible ingredient, utensils, refrigerator, water system and some ready-to-eat snack is available. Move few steps straight from the entrance and you reach the dorm area where there are bunk beds for sleeping. On the right-hand side, there are stairs that lead you to the first floor where there are more bunk beds. Climb more stairs and you'll reach the top floor where surprisingly, there is a swimming pool, seeing which we were more than happy. 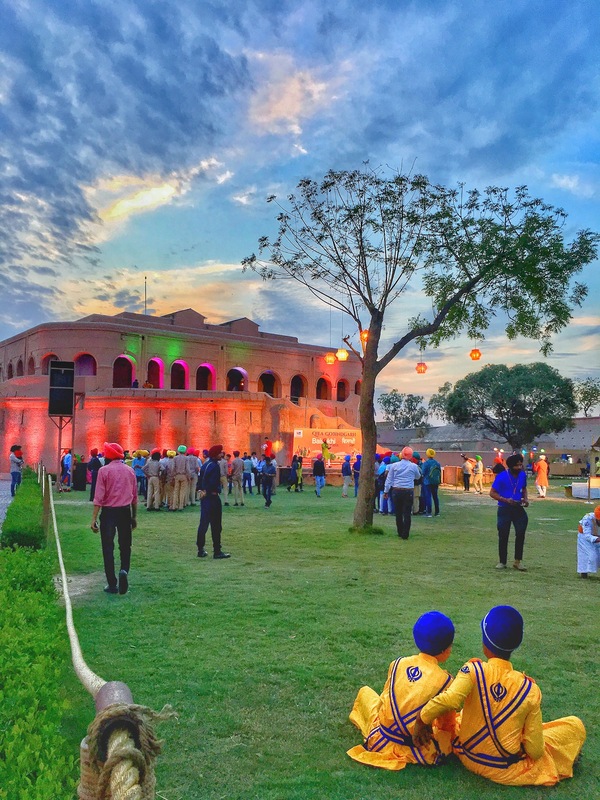 How Did We Spent Our 115 Hours in Amritsar? The SOS Meetup, TravelXTalks was scheduled to take place on 15th of April, so we had good several days to explore the city. 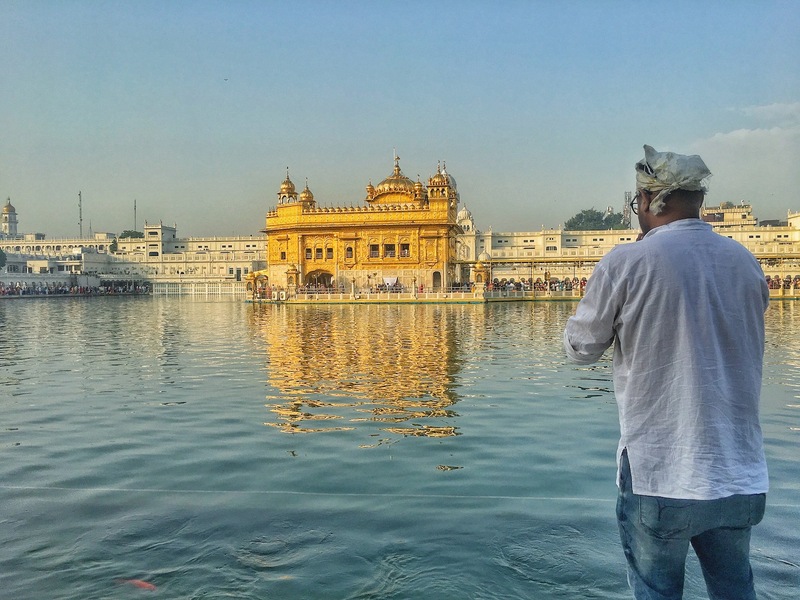 This was not the first time that we were in Amritsar but each time it had been a different experience and this time was no exception. We had great fun. 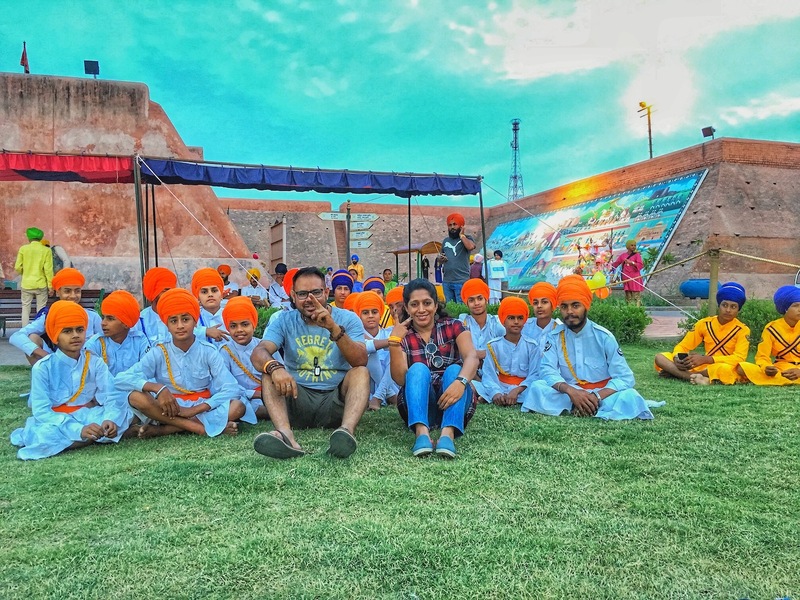 Want to know what all we did in our Amritsar trip and why we are writing 115 hours rather than 4-5 days because each and every hour we enjoyed a different thing and still having great memories. Head on to know what we did! We reached Amritsar on 13th April around lunch time. 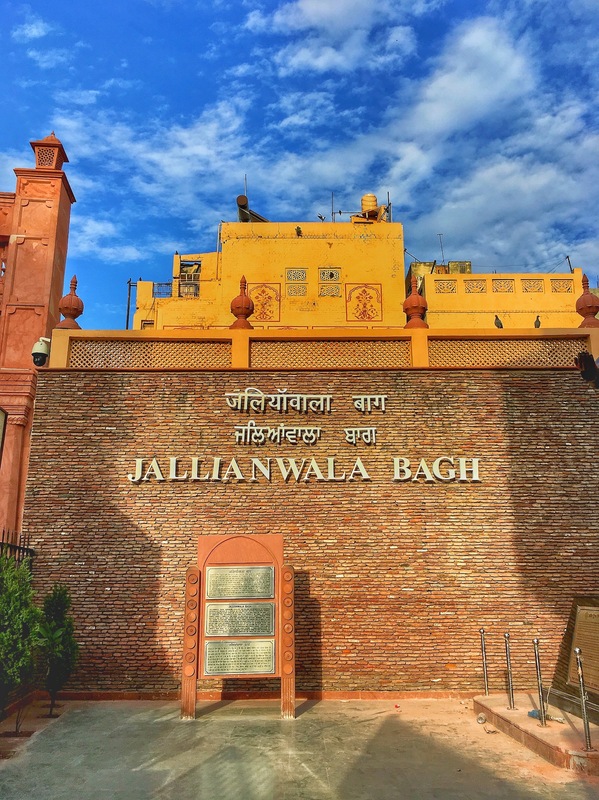 After meeting everybody there and taking rest, we went to Jallianwala Bagh in the evening. Coincidently, it was the same day when the Jallianwala Bagh tragedy took place. So, there were arrangements made to pay homage to the martyrs. 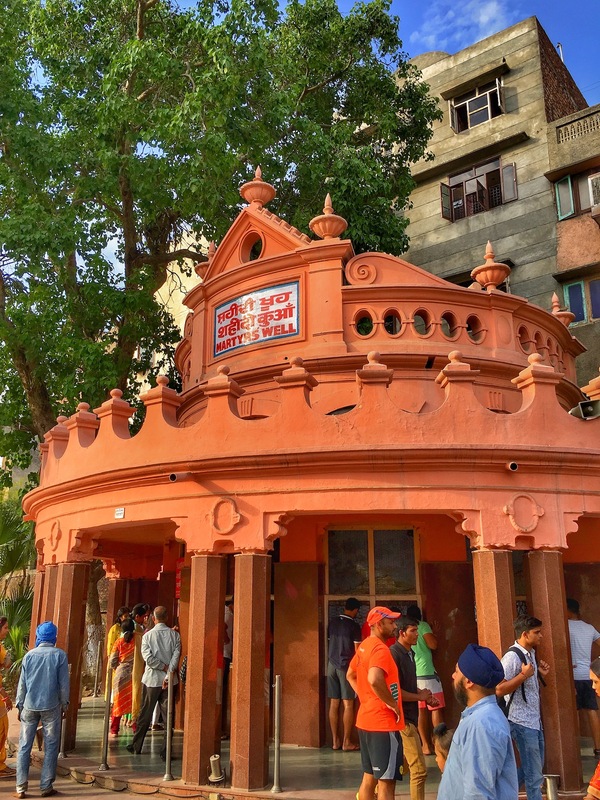 The below picture is of the Martyr’s well where people jumped to escape gun firing by the Britishers. Bullet Marks were on every building rectangled by white lines. 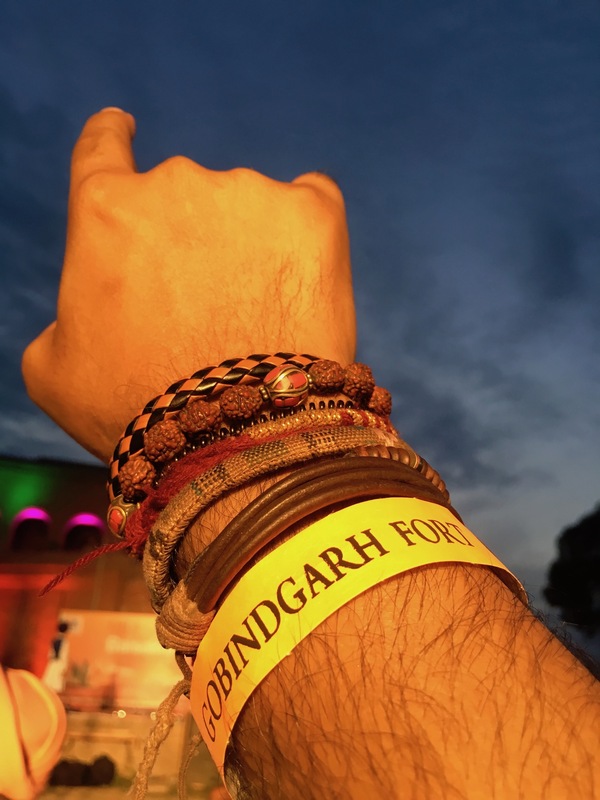 Later in the evening we went to Gobindgarh Fort where Baisakhi Fair celebrations were in full swing. It was a wonderful evening with colours, music and lively atmosphere around. 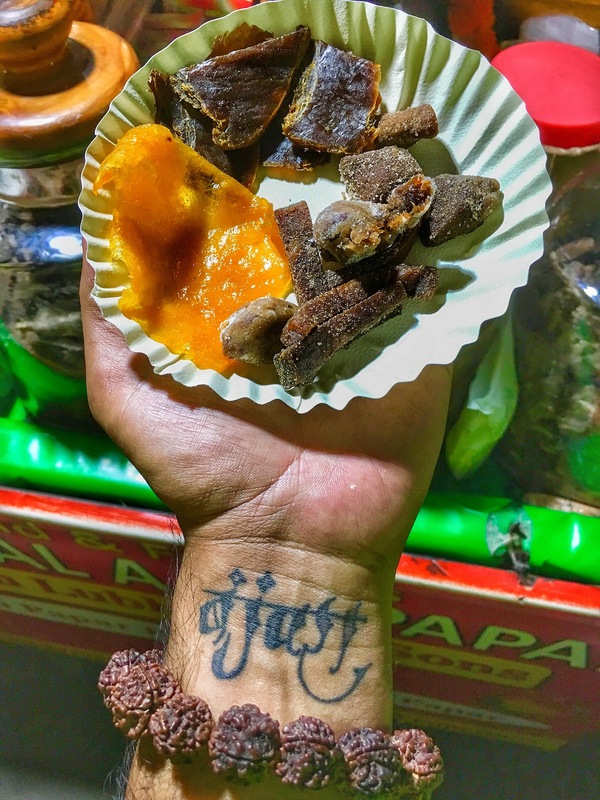 USP of this food bicycle ride was our visit to one of the oldest cart selling hundred of types of Aam Papad that tasted delicious and we bought few of them for our home too. CoupleOnBike was now CoupleOnBicycle for some time. We enjoyed pedalling on the streets of Amritsar somehow conveying the message of going green. 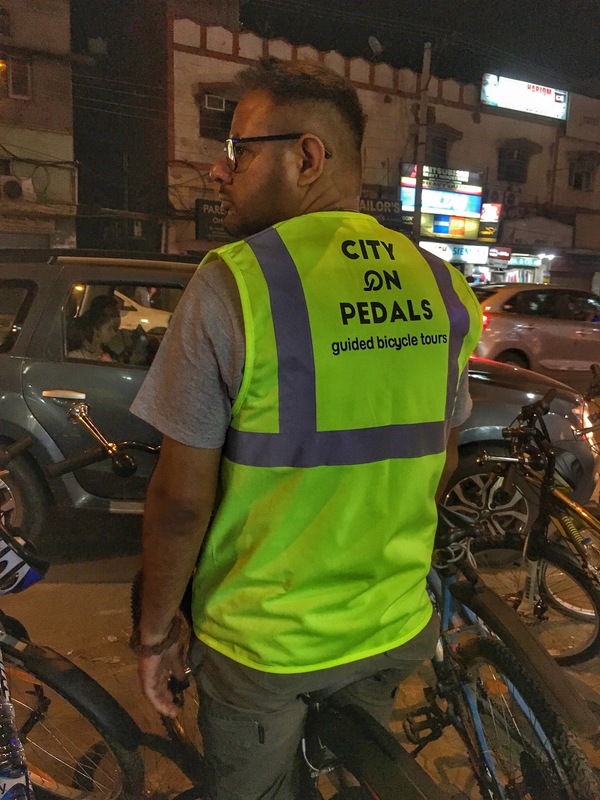 All thanks to CityOnPedals for such a nice experience. There after, we came back and had a good chitchat session with our travel buddies. 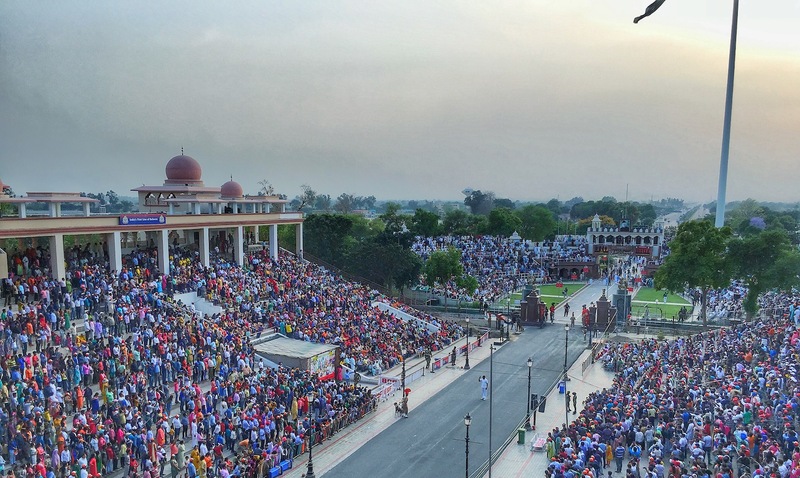 For the second day, we had planned to go to Wagah Border to enjoy the flag hoisting ceremony. After standing in the security check queue for long hours, we reached the main place where the ceremony takes place. 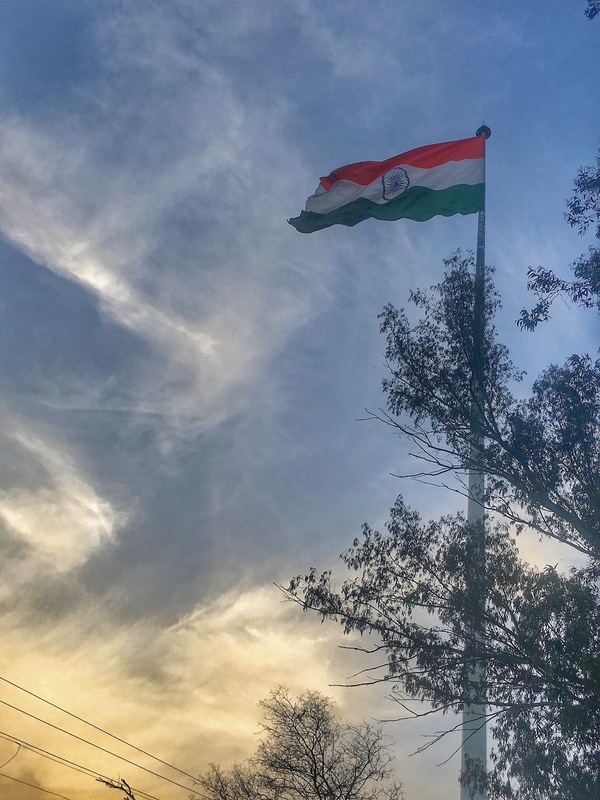 The entire ceremony, I tell you leaves you patriotic and you feel so proud of your country. Thereafter, we planned to go to the Golden Temple. After taking rest for sometime, we all got ready and headed to the Golden Temple in an auto. It was fun auto ride. We clicked many pictures as the lightnings were making the temple look stupendous. The good vibes of the place added to the experience. Around 9:00 in the morning, we came back to the hostel and dozed off. So, it took us around 7 hours for going in Amritsar temple, have blessings and coming out. On 15th morning, we had meeting with the editor of Dainik Bhaskar for a small interview that got published the next day. Can you tell who is missing in the picture pinned here. Yes, its me 🙁 . When the camera person came to take our group picture, I went to the washroom. Bad timing, I tell you! The next thing up was the main event for which we all were there. We headed to Cafe Chockolade which was the venue for the event. There we met few people who had specially come to listen to us, have words with us and share their stories with us. 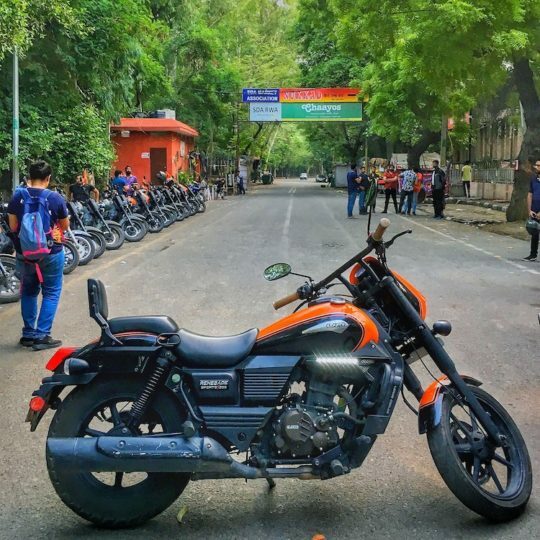 After sometime, the meet was initiated by Arjun. He then called us all one by one to share our travel stories and experiences with the people. 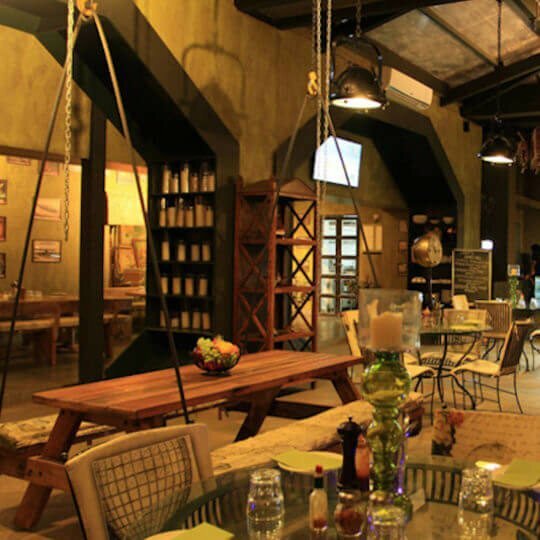 The owner of the cafe is a warm person who ensured all the people had wonderful time. The meet concluded on a sweet note. 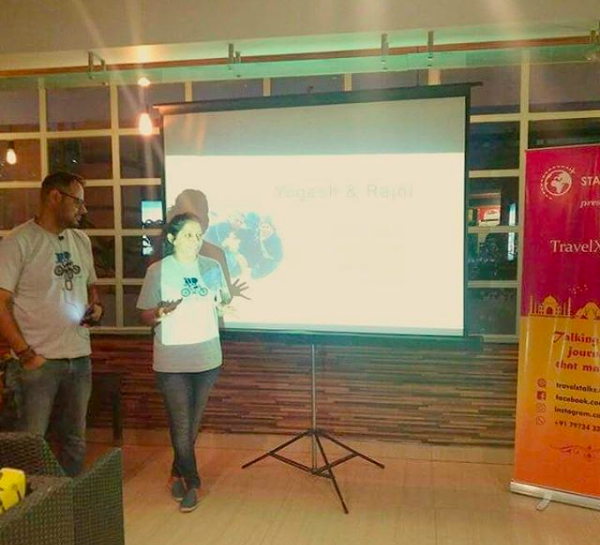 Sharing our travel stories and listening to travel stories of other people made us learn a lot and we enjoyed each and every bit of the meet. Some of our friends had to leave the same day whilst few of us stayed back. Later that day, we went back to the hostel and enjoyed pool party. Yes, pool, music, dance and what not! We enjoyed that day a lot. Drenched in water, we came back to the living area and then sat back relaxed continuing with our chit-chat session. 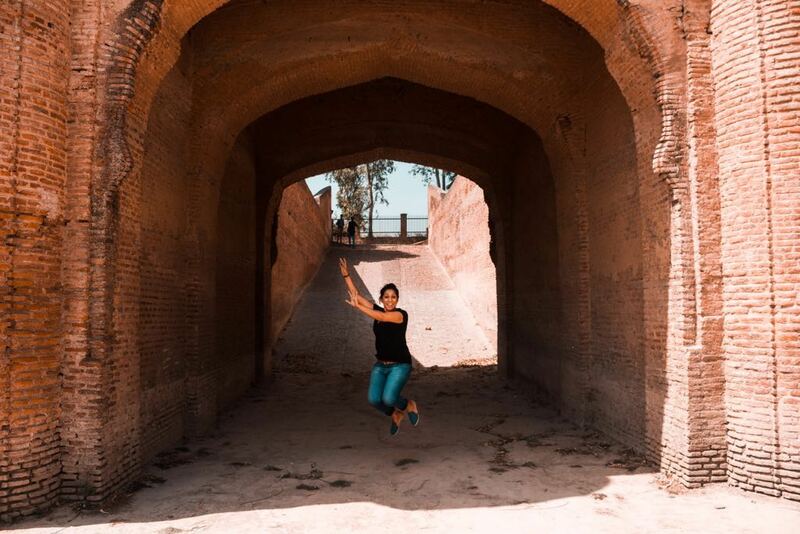 Next morning, I went to Pul Kanjri, the historical place in Amritsar with one of the travel bloggers (Niharika). 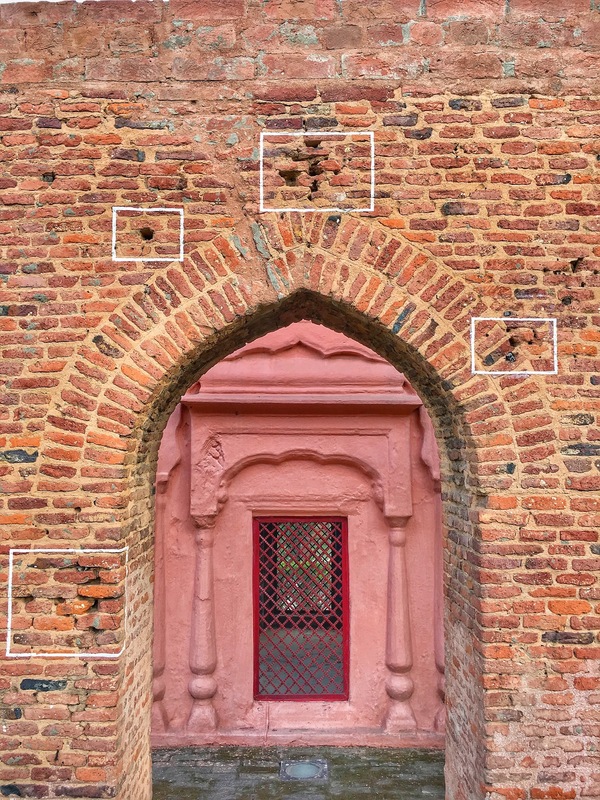 There, we clicked many pictures and tried capturing the historical site and beauty of the place in our cameras. 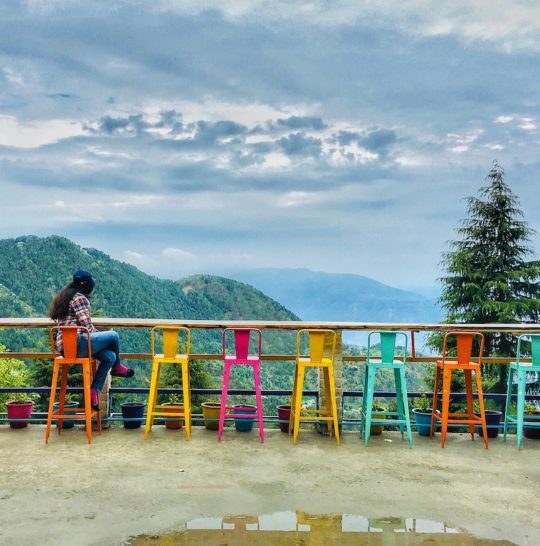 Also, thanks to Niharika for clicking so many good pictures of mine. Sharing the one which I love the most. Thereafter, we headed back to the hostel. Most of our buddies had left. 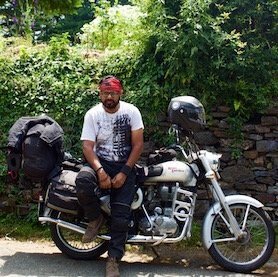 As we had to travel on our bike and weather was not good, we didn’t take a chance and planned to leave for Jaipur the next day. On that evening, we (Me, Yogesh, Sam, Ekansh and Rahul) sat back and relaxed enjoying a good bakkar session. It was so much fun. Rahul, I tell you has such a good sense of humour and is a cool storyteller. Ekansh and Sam shared many stories and we all had amazing time together. 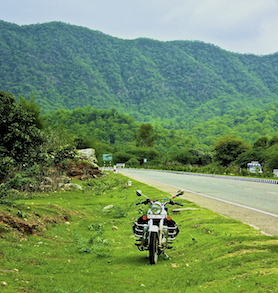 Next day early in the morning, we packed our bags, got ready and after leaving a note on ‘walls of imprint’, we started our ride back to Jaipur. Gosh, it was a super scorching hot day. We heaved a sigh of relief in the late afternoon hours and reached home late night. How to Reach Nomads Hostel? 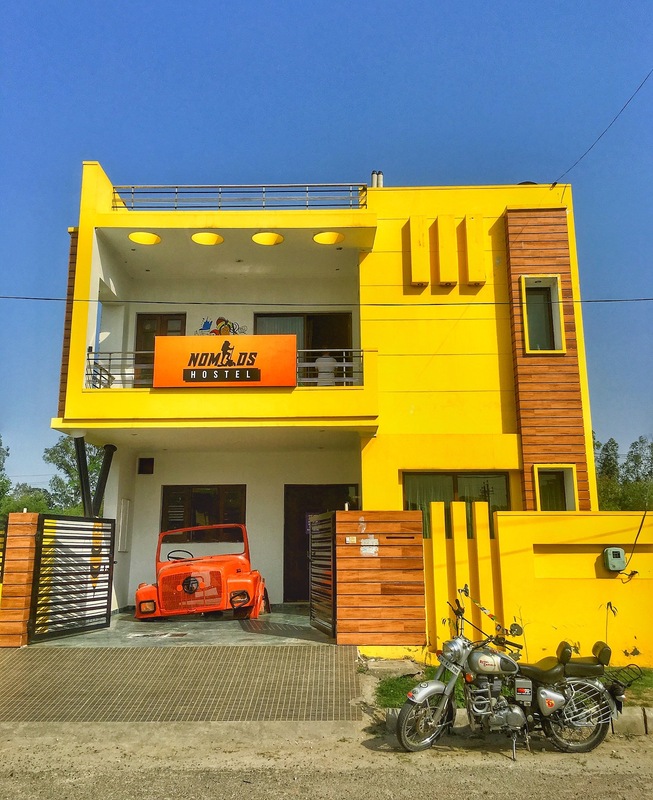 Away from the hustle and bustle of the city, yet very near to the local attractions, Nomads Hostel is in outskirts and not in the main Amritsar city. 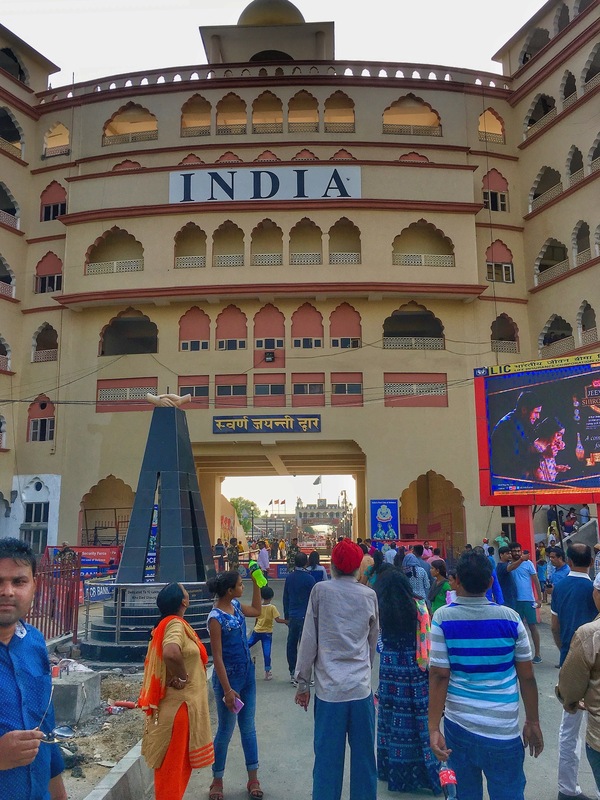 We recommend you to turn your GPS on and put Nomads Hostel to get the right directions once you hit the Amritsar flyover when coming from Delhi side. 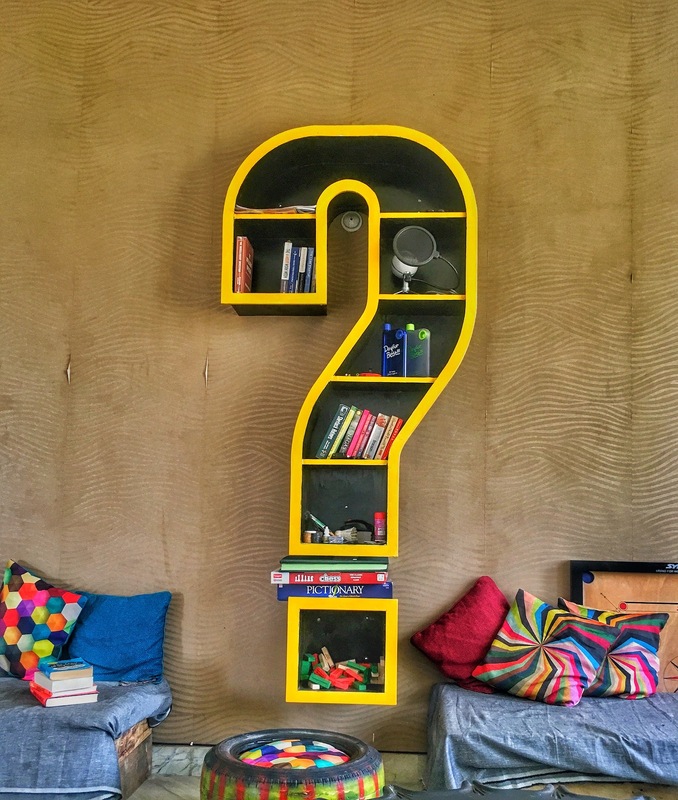 How to Book Nomads Hostel? To book, you need to head on to where Nomads Hostel website where bookings can be made. When we travel, we tend to bring home some sort of souvenirs. 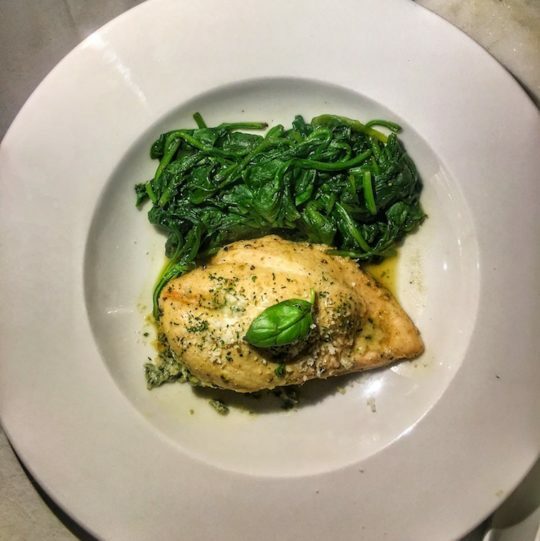 Want to know what CoupleOnBike brings along? Well, innumerable stories, many bonds, wonderful memories, urge to travel more. Amritsar trip was an awesome one and we met so many cool people who are now our buddies. For me, it was a refreshing trip where I learnt not one or two but a lot many things. All thanks to StayOnSkill. We both have many new friends and feel so much motivated and inspired. 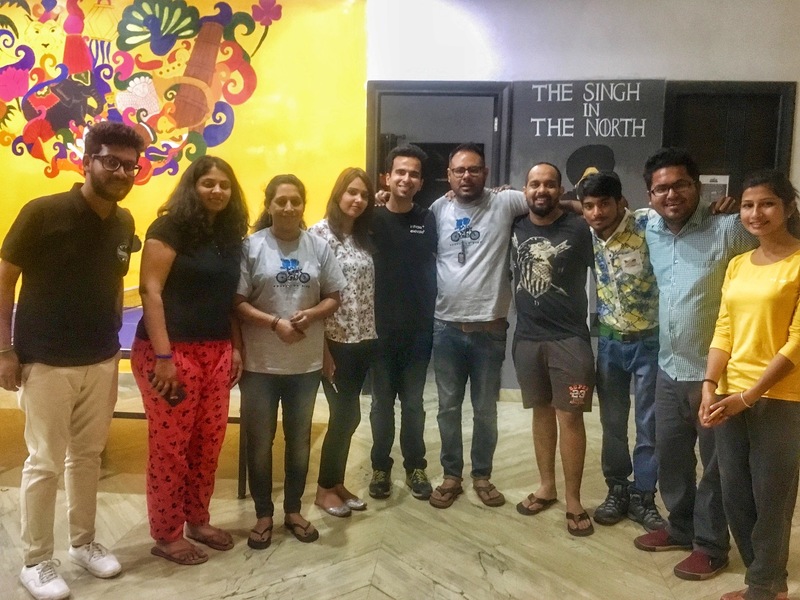 To wrap up, SOS Meetup and TravelXTalks in Amritsar arranged by StayOnSkill was really awesome. Not to forget our stay at Nomads Hostel where we enjoyed some of the most memorable moments that we will cherish forever. This was the very first time we stayed together and created a lot of memories. I still miss this Amritsar trip. After going through this blog “sari yadein taza hogyi”. More power to you both. Hope to see you/travel soon! Undoubtedly, it was one of the coolest trips where we got to know more about you all. Will cherish the memories of this trip forever. Hope you liked the write-up. Hey Rajni! This is a wonderful piece! 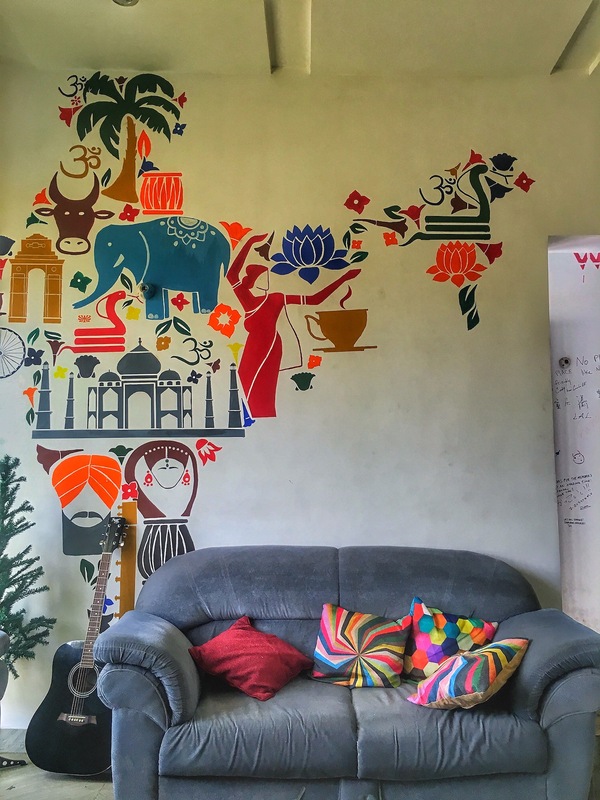 Nomads Hostels looks cool And the pictures are delightful. I’m sure you guys had a wonderful time. Stay on Skill rocks!!! 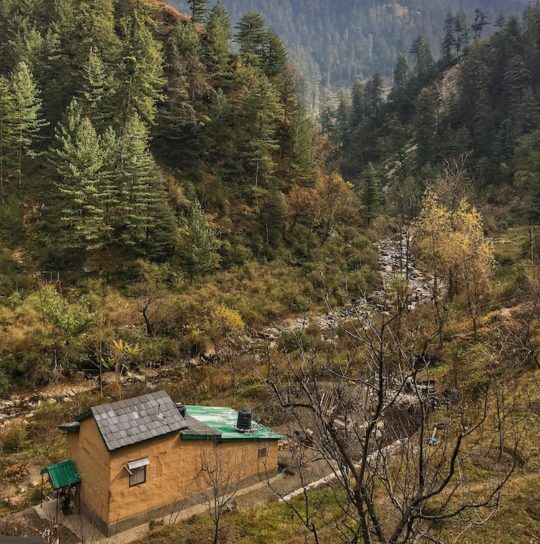 I have been following the posts from you guys and SOS about TravelXTalks and loving them. Keep traveling. Keep writing. 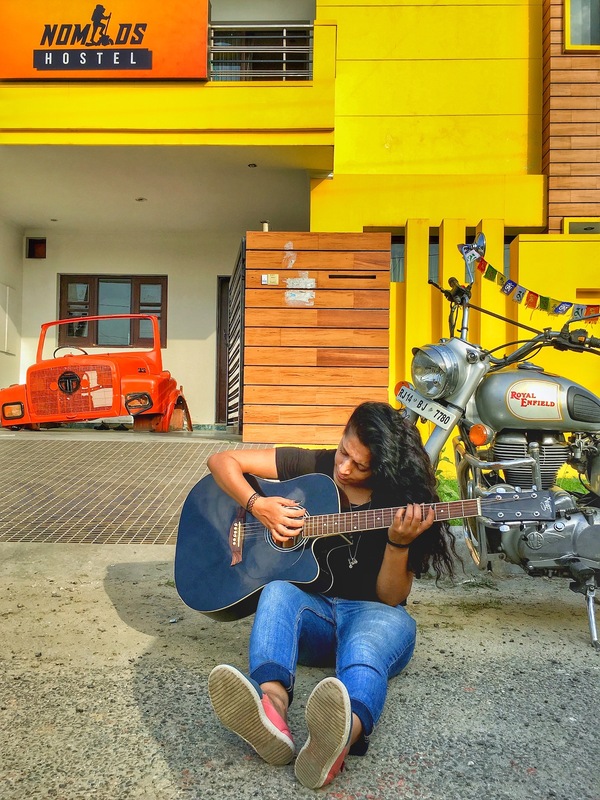 Anjali, Nomads hostel is vibrant and cool. 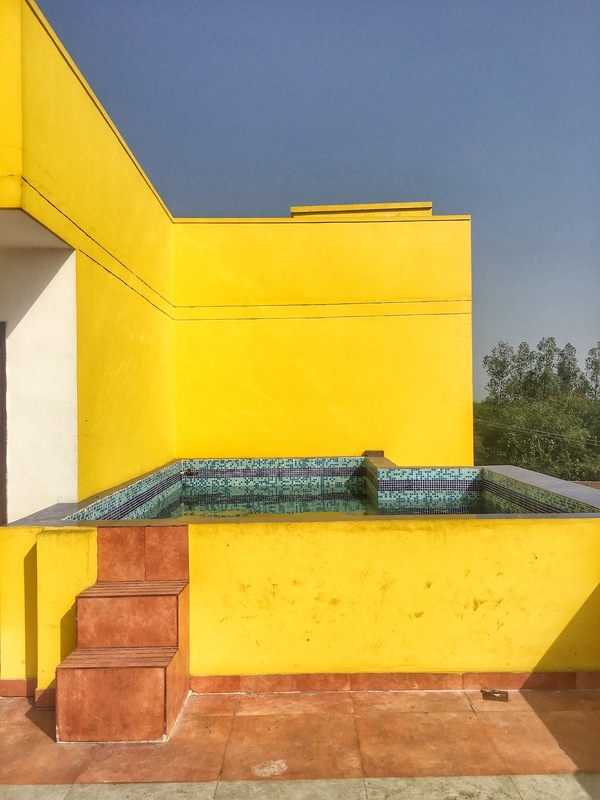 The best part is that there is a swimming pool and it’s located a bit away from the city which makes it a perfect place to stay away from the hustle and bustle of the city. And yes, thanks for such appreciative words. Truly motivating. A moment of nostalgia hit when I went through whole of the article. It was such a fun meetup with you guys and you have captured it in words and photographs so well. Thankewwww Niharika. 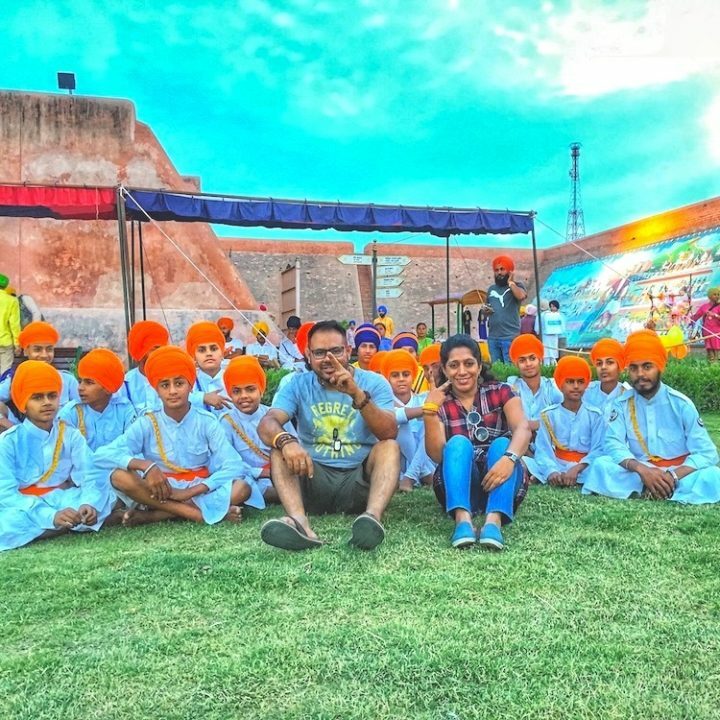 🙂 Amritsar trip was, I’m sure one of the best trips of each one who was the part of it. Love the pictures. The hostel vibes can reach me through those. Beautifully written.